At Jungle Friends our motto is #NeverGiveUp. Blue and Fiona didn't give up! We have been working diligently over the last few months preparing for 57 squirrel monkeys who, after eight years of planning, are finally being released from research. The greatest demand for sanctuary care at Jungle Friends is for monkeys being released from research, a welcome trend! 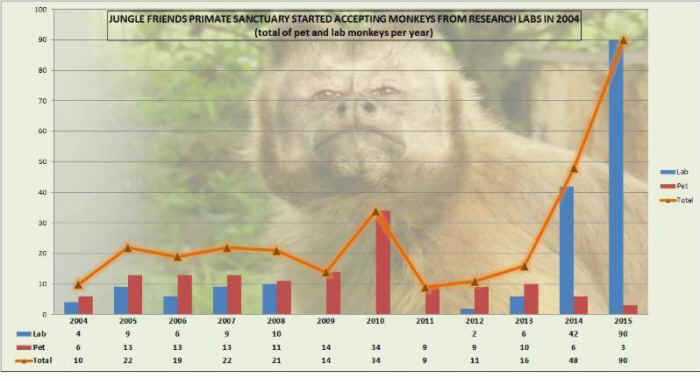 Within the past 18 months we have offered homes to 76 monkeys retired from the lab and are in active discussions with other universities who wish to retire their monkeys. The American Society of Primatologists (ASP) held its annual meeting in Bend, Oregon this month. Jungle Friends Primate Sanctuary was part of the Symposium: The Advancement of the Modern Primate Sanctuary and the Growth of Collaborative Opportunities. Jungle Friends Founder and Director, Kari Bagnall, addressed attendees with her presentation "Research Retirement: Bridging the Gap Between Research and Sanctuary" where she outlined ways universities and primate sanctuaries could work collaboratively to retire research monkeys. To further the agenda of retiring research monkeys, Erika Fleury, North American Primate Sanctuary Alliance (NAPSA) Program Manager, gave her presentation on "The Evolution of Primate Sanctuaries in the United States". We appreciate that we had the opportunity to present NAPSA sanctuaries and our work to the ASP crowd. It was apparent there exist many ways that the sanctuary and research communities can join together to benefit the primates involved. We look forward to future collaborations with the ASP community. If you would like to be a part of this movement please consider making a gift to our Research Retirement Fund.